I had just started taking pictures of a Corvette that was for sale in the parking lot of a quarry operation on the main highway, north of Watertown, WI. The car wasn't that interesting, but I had flashed on this silver sports car with these gray piles of gravel behind it in the flat, overcast light. Or maybe against the row of huge black dump trucks in the lot. I had barely raised the camera. "What's that thing worth?" boomed a voice from over my shoulder, startling me a bit. I turned to see Fred watching me. He had just come out of the office carrying his lunch cooler, knocking off for the day. I said I wasn't sure... maybe $25 grand. "Sheeew. Guess I'll be stickin' with my Jeep," Fred grinned. Fred drives that dump truck you see behind him in the picture, which he has been doing for 23 years "for this company. 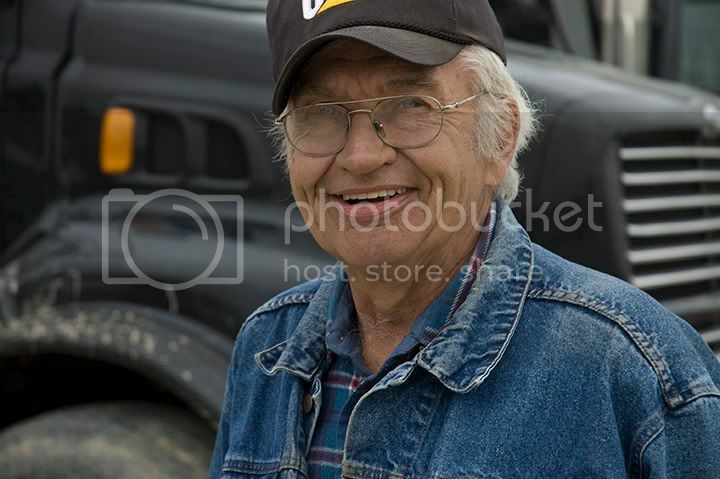 I climbed into a truck back in 1970." Big grin, as I started to do the math. Fred asked me where I was from, and when I told him, he mentioned "that school for boys". I guessed he was referring to a prison for juveniles that is not far from my home, but there's also a military academy in town. "The bad boys?" I asked. After I said it, I realized there was still room for interpretation. "Well," said Fred seriously, "I really don't believe there are "bad" kids..."
"My dad died two months before I was born," he continued. "When I was 12, my mother told me "You're old enough to run the farm now, Fred. I'm going to get a job in town." And from the next day, I was up at 4:30, taking care of the cows, the chickens... and when I got home from school, I milked the cows, and fed all the animals again". "One time, when I was 15, my Mom gave me $158 and told me to drive the tractor down the road and offer the money to the farmer who had a corn planter for sale. She said that's all we could afford." I believe Fred's point was that kids live up to their parents' expectations, and it's up to parents to set them high. After I shot this picture of Fred, he said "Well, I best be going. Don't want to worry the wife." Extending his hand and flashing that wide smile, he asked "You got one of those? You know from which I speak?" I hope Fred and his wife have a bunch of kids, but I never got to ask him. Labels: "truck driver", "Watertown, quarry, truck, Watertown, WI"